CALEDONIA — Looking to move to 3-0 overall and 2-0 within the conference, the Tigers boys tennis squad headed to Caledonia on Thursday for a clash with the hosting River Valley Vikings. Galion would, in fact, do just what they set out to do, handing River Valley the defeat; 5-0. Matt Gimbel battled his way to a 2-6, 7-6 (tiebreak, 8-6), 6-1 victory at first singles before Chris Amick claimed a 6-4, 7-5 win at second singles. At third singes, Zach Grimes cruised to the clinching point in the match; 6-3, 6-2. In doubles play, Rose and Dicus picked up point number four; 6-3, 6-2 while Hollis and West finished up the shutout in second doubles action; 8-6, 7-5. Galion will be back in action in Heise Park on Tuesday, April 2 as they host MOAC foe, the Harding Presidents. MANSFIELD — After beginning their season with a Mid-Ohio Athletic Conference victory, the boys tennis team from Galion High School headed to Mansfield on Wednesday for a non-conference clash against the hosting Madison Rams. The Tigers improved to 2-0 early in the season by defeating their hosts by a 4-1 margin. Amick picked up a point for Galion in second singles, defeating his opponent; 6-1, 6-4 while Grimes claimed point number two for the Tigers in third singles, winning in straight sets as well; 6-0, 6-0. Gimbel lost a tough first singles match to his Madison opposition; 5-7, 3-6. In first doubles action, Rose and Dicus battled their way to victory; 6-3, 7-5. The second doubles tandem of Hollis and West would also go on to a victory in straight sets; 6-1, 6-1. 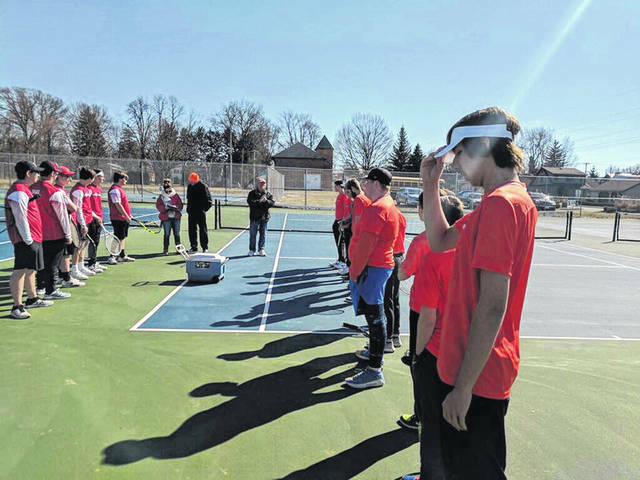 GALION — With Monday’s season opener against Mansfield Senior being postponed, the Galion boys tennis team officially got their 2019 season underway on Tuesday, March 26 against the visiting Pleasant Spartans. Gimbel, a freshman, earned a victory at first singles in his varsity debut; 6-1, 6-3 to pick up the first point of the year for the Tigers and would be the only singles player to come away with a win. Amick was defeated at second singles; 2-6, 4-6 and Grimes fell in third singles play; 4-6, 1-6. After Rose and Dicus earned a win at first doubles to tie the match at 2-2, the dual victory rested on the outcome of the second doubles meeting. Hollis and West would rise to the occasion, overcoming an opening-set loss and defeating their Spartans opponents by a score of 3-6, 6-2, 6-0 to give the home team the match victory.